JIANGSU RUDONG /China/, July 19. /TASS/. Gas supplies to China via the Power of Siberia natural gas pipeline will reach the contracted level of 38 bln cubic meters by 2024, CNPC’s representative said Thursday. "Supplies via the ‘eastern route’ are expected to start by the end of next year, initial volumes are 5 bln cubic meters, which will reach 38 bln cubic meters per year by 2024," he said. 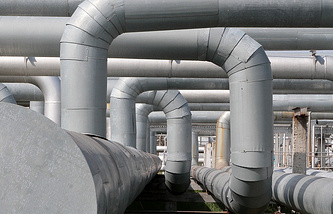 The date of the start of gas supplies via this pipeline has been set at December 20. The Power of Siberia gas trunkline will transport gas from the Irkutsk and Yakutia gas production centers to consumers in Russia’s Far East and China (the so-called ‘eastern route’). In 2018, Gazprom plans to invest almost 218 bln rubles ($3.9 bln) in the project. In 2017, Gazprom's investments into the Power of Siberia pipeline amounted to 158.8 bln rubles ($2.8 bln). In May 2014, Gazprom and China National Petroleum Corporation (CNPC) signed a sales and purchase agreement for gas to be supplied via the ‘eastern route’ (Power of Siberia gas pipeline). The 30-year agreement provides for Russian gas deliveries to China in the amount of 38 bln cubic meters per year. The contract is worth $400 bln.